Insight about your overall health can sometimes be seen in your mouth. In fact, periodontal (perry-oh-DON-tal) - or gum - disease is common in people with chronic diseases like heart disease or diabetes. This page explains the connection between your oral health and your overall health. Gum disease is an infection and inflammation that affects the tissues and bone that support your teeth. The infection is caused by the bacteria in plaque, a sticky film that's always on your teeth. Your body reacts to the infection and your gums will become inflamed - red, puffy and swollen. 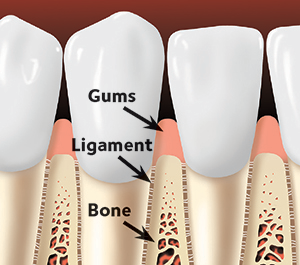 If left unchecked, gum disease affects the tissues and bone that support your teeth. It is the most common reason why adults lose teeth. When your body reacts to this infection and your gums are inflamed, this condition is called gingivitis (jin-ja-VY-tis), and it can lead to more serious types of gum disease. The good news about gingivitis is that it can be reversed. If the gum disease is caught early enough (when it is gingivitis), you may simply need a professional cleaning. Your dental team can also give you advice for improving your daily oral hygiene. 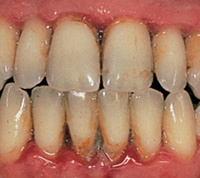 If gingivitis is not treated, it can turn into periodontitis (perry-o-don-TIE-tis). 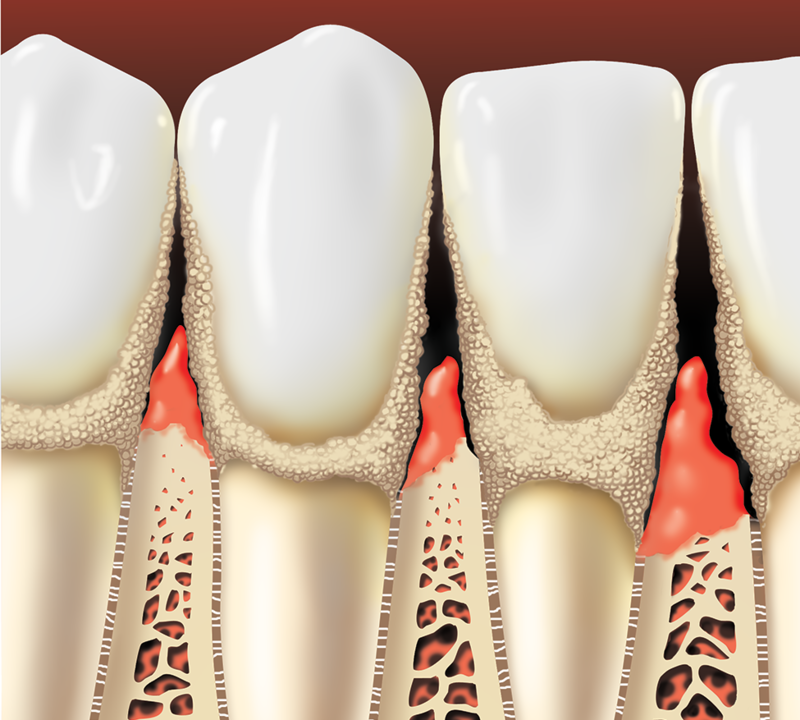 Periodontitis is usually not painful, but it can lead to bone loss. Healthy gums and bone hold teeth firmly in place. Periodontitis happens over time, as plaque builds up along the gum line. Your body responds to the toxins that the bacteria produce by breaking down the gum tissues and bone around your teeth. You may notice one or some of these warning signs, or you may not have any signs of gum disease at all. This is why it's important to see your dentist regularly - treatment of gum disease is most successful when it's caught early. Keeping your teeth and gums healthy is very important. Using tobacco products of any kind (cigarettes, dip/chew, e-cigs, hookah, etc.) is a common risk factor for many chronic diseases including gum disease. Tobacco increases the risk of getting gum disease. The disease can also get worse the longer you use tobacco. Many of the medications used to treat other diseases can affect your mouth by causing dry mouth. These include medications used to treat blood pressure, allergies, and pain. Dry mouth can increase your risk of tooth decay and gum disease.